The movies will be in theaters that show 3-D for two weeks only starting this Friday (Oct. 2). Check your local listings for availability. 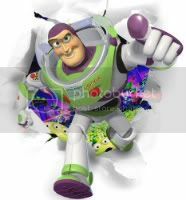 As you probably recall, the movies star Tom Hanks as Woody; Tim Allen as Buzz Lightyear; Joan Cusack as Jessie; Don Rickles as Mr. Potato Head; Estelle Harris as Mrs. Potato Head; John Ratzenberger as Hamm; Wallace Shawn as Rex; and Jodi Benson as Barbie. I am going to go broke seeing all of these movies.